Since the resignation of Pascual Ortiz Rubio in 1932, Mexico has enjoyed uninterrupted presidential continuity, a streak that is unmatched by any major political system in the Western Hemisphere (and possibly among the longest in the world). Over the course of these 82 years, no presidential term has been cut short due to death, assassination, resignation, coup d'état or any other sort political upheaval and as a result, it has become difficult to imagine an interruption to this orderly succession that most Mexicans have taken for granted. 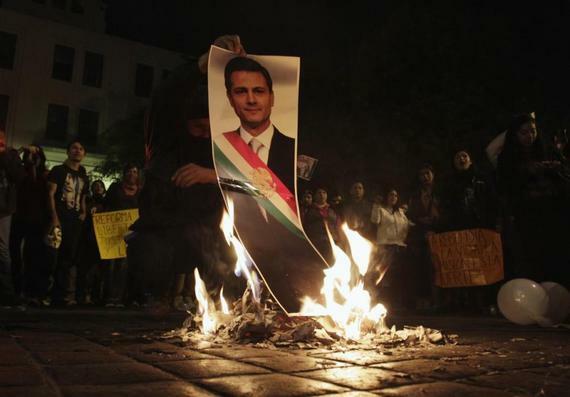 However, the outbreak of social unrest from the Ayotzinapa crisis combined with the streak of scandals that have engulfed the presidency of Enrique Peña Nieto over the past two months have perhaps made the unthinkable slightly less so. For those of us in the business of analyzing political and economic risk, the last few years have demonstrated that highly improbable events do in fact take place and therefore deserve a more nuanced look. The Mexican Constitution offers a relatively unambiguous process of presidential succession, at least at first glance. According to Article 84, in the event of the "absolute disability" of the president during the first two years of his six-year term, Congress would reconstitute itself as an electoral college and would designate an interim president followed by a new election within 7 to 9 months. However, if the president's absence takes place after his initial two years in office (as would be the case now), Congress would designate a substitute president that would complete the remainder of the term; there would not be an election in this case. Article 86 further specifies that the president may only resign voluntarily in the event of a "grave cause" (causa grave), which would have to be defined as such by Congress. Between the time that the president becomes absent and an interim or a substitute is designated (no more than 60 days), the interior secretary (presently Miguel Osorio Chong), would act a provisional president. However, things could get tricky in practice. In both scenarios, the interim/substitute president would have to be designated with an absolute majority vote (50% plus one) in Congress and the Constitution does not specify what would take place in the event that an absolute majority is not reached. Under the existing composition of Congress, finding a potential successor to the president would therefore be faced with the issue of the PRI and its allies falling just short in terms of total legislators: 313 out of 628 (500 in the Chamber of Deputies and 128 in the Senate). Its shortfall is minimal: just two more votes would be enough to give it the absolute majority, but the math makes it clear that a united opposition could in fact push through its own candidate if it wanted to. As for dismissal, Article 108 of the Constitution also mentions the two crimes that could be grounds for a removal of the president: treason and "serious common (i.e. non-federal) crimes" (delitos graves de orden común), the latter which is somewhat ambiguous and would presumably require Congress to define. Article 110 further specifies the process through which any public official could face impeachment. This would require an absolute majority in the Chamber of Deputies followed by a two-thirds vote by the Senate to ratify the sentence and sanction. Article 111 states that in the specific case of the president, he can only be accused in the Senate. Obtaining a two-thirds vote would therefore require a share of Peña Nieto's fellow PRI senators voting against him, which suggests that he cannot be realistically removed from office by Congress. It is quite unlikely that the current political crisis will be diffused without some sort of shake-up in the government; even if tensions subside over the coming weeks (which is surely what the government is banking on given its recently announced plan to combat corruption), the potential for some future event reigniting the unrest will remain latent. Here are a few scenarios of how the political crisis could play out in the event that it leads to actual government change. Scenario 1: Major cabinet shake-up. Peña Nieto and his team (probably influenced by PRI stalwarts not in his inner circle) could decide that the least damaging concession is to remove certain key members of the cabinet. In this case, the first name on the list is likely to be Jesús Murillo Karám, the attorney general, who has been lambasted for the federal government's delay in responding to the kidnappings in Iguala, as well as in offering a convincing explanation of what fate befell those 43 students on September 26th after they were carried off by municipal police and handed off to a drug gang. Another security-related cabinet member that could face the axe might defense secretary Salvador Cienfuegos, who has also been criticized for the Army's summary execution of 22 alleged drug gang members in Tlatalya, on June 30th. However, Gen. Cienfuegos' close ties to the president may preclude this. Although unrelated to security, education secretary Emilio Chuayffet and energy secretary Pedro Joaquín Coldwell are also at some risk of being shuffled out, in both cases for maintaining such a low profile in two key sectors that have been targeted for reform. Both are old-guard PRI members, but not particularly close to the president who could probably do with having someone with more vigor and experience in their respective sectors. Transport secretary Gerardo Ruiz Esparza could be in line for replacement, given the fiasco over the cancellation of the Mexico City-Queretaro bullet train tender. Lastly, the possibility of the first lady "voluntarily" renouncing her directorship of the DIF would be unprecedented but warranted given that she is the focus of a major scandal. Would this shake-up be an acceptable concession? Perhaps not, given that the changes are merely superficial; Peña Nieto's inner circle and the political establishment as a whole remain intact. But it could buy the government time and in the absence of another Ayotzinapa-style tragedy or political scandal, may well be enough to ensure its survival over the next four years. Scenario 2: President resigns, PRI chooses replacement. Assuming that protests intensify and are complemented by nation-wide strikes as well as other forms of civil disobedience, the possibility that the president is pressured into resigning would perhaps not be so chaotic insofar as violence is contained and Congress immediately moves to apply the process of succession outlined in the Constitution. The question now turns towards who would be designated as a substitute president for the remaining four years of the current term. The party best poised to name this substitute is the ruling PRI. But is there a member of the PRI that could be both an effective leader, commit to a reform of the political system, and regain the trust of those who have rallied against Peña Nieto even before he took office? The short answer is: no. Much of the criticism of Peña Nieto has been equally aimed at the PRI and surely his detractors see the person and the party as part of the same machine. However, this is not to say that there isn't any other PRI member that could be a much more effective statesman and policymaker. The one that comes to mind is Manlio Fabio Beltrones, who had it not been for Peña Nieto's existence may well have been president today: he reluctantly withdrew himself as a pre-candidate when the rest of the party closed ranks in favor of Peña Nieto, who was seen as more charismatic. However, despite Beltrones's shrewdness and mastery of Mexican realpolitik, his reputation as part of the old PRI establishment would likely dampen hopes that substantive political reform could be achieved under his watch. Concerns over the old PRI's penchant for repression and a corporatist style of government would also suggest that placing Beltrones in the presidency would be a step back in terms of addressing the issues of corruption that plague Mexican politics and are at the root of protesters' fury. In a nutshell, replacing Peña Nieto for another PRI stalwart would offer little advantage from the scenario of a government shake-up. There are no true reformists in a party that finds its greatest comfort and success in cradling inside the very political establishment that it created in the aftermath of the Revolution, and that has chronically resisted transforming it into one more compatible with the ideals of a true liberal democracy. ¿Could the opposition appoint one of its own instead? In theory, yes, although it would remain to be seen whether sufficient cohesion exists between the PRD and PAN to put forward a candidate acceptable to both (as well as to their own highly divided memberships) and whether there is a deep enough commitment to political reform. Public opinion of both of these parties is also currently quite low as a result of their own recent scandals, which explains why neither has found a way to effectively capitalize on the president's woes. Scenario 3: President resigns, non-partisan replacement is chosen by inter-party consensus. The possible gridlock caused by its lack of an absolute majority in the Senate could be the catalyst for discussing the possibility of a non-partisan political figure to act as substitute president for the next four years. This person would have to have three main characteristics. The first is that he or she must command the respect of a sufficiently large segment of the Mexican population and have a professional career that leaves no question marks over his or her moral integrity. Second of all, the person must have had some experience working with government, even if he or she has not worked directly for it or has never been elected to a public post. Third and perhaps most importantly, the person should generally be seen as ideologically compromising, capable of appealing to politicians and ordinary Mexicans from all sides of the spectrum. There are various personalities in Mexico's political scene who meet all three characteristics to some extent but there are two that could perhaps fill the role best. The first is Juan Ramón de la Fuente, who served as health secretary during the administration of Ernesto Zedillo and was later appointed rector of the UNAM (Mexico's largest public university) in 1999 following a major crisis in the institution, which he was able to diffuse. De la Fuente has never been a member of any political party despite being seen as an appealing figure to the left, to the extent that Andrés Manuel López Obrador suggested him as a potential education secretary in the event of a victory in the 2012 election. The second is José Woldenberg. He is best known for having been the director of the federal electoral institute (IFE) during the 2000 election, essentially ensuring that Mexico's transition from seven decades of one-party rule to an electoral democracy ran smoothly. Despite being a member of various socialist parties earlier in his career and later the PRD, he is identified nowadays as being right-leaning but should still be an acceptable choice to all but the most radical of leftists. Crucially, neither is likely to reverse the structural reforms that have already been passed. Regardless of who is chosen, it still remains to be seen whether they would be capable of undertaking the necessary political changes that most Mexicans would agree have been long overdue, especially since they would operate in the context of a Congress that would still be dominated by three parties who have a vested interest in keeping the system as close to intact as possible. One can still hope, however, that a strong non-partisan leader could push them forward better than anyone else. Political instability and economic dislocation generated by chronic social unrest is undoubtedly the scenario most feared by those who have taken a vocal stance against the protests. In what shape this instability could manifest itself is difficult to assess given that there is no immediate precedent in modern Mexican history. What is certain, however, is that any prolonged period of unrest will undermine the possibility of an economic recovery in the short run, and possibly create a vicious cycle of further discontent. Consumer confidence figures for November set to be released later this week may show the first glimpses of the economic impact of the political crisis. That said, it seems debatable whether an outbreak of severe political instability could take place in Mexico. First and foremost is the fact that the bulk of Mexico's discontents are students and middle/working class citizens without a central leadership and with little capacity for applying organized violence. Although a handful of left-wing radicals can be found within their ranks - and some of them with links to guerrilla groups like the EPR (which has a presence in Mexico's south) - these are incapable of anything more than regional disruption. Mexico also does not have a history of military intervention in politics since the Revolution, which would preclude the armed forces from taking an active role in the crisis. Lastly, the entrenched nature of the country's three main parties further suggests that they would move forward quickly to ensure as smooth a transition as the circumstances permit since neither of them stand to benefit from prolonged disorder. Still, the possibility of an ebb and flow of disruptive - but not destabilizing - protests is a serious one. In the absence of a credible threat to the government's survival (as was the case of the Argentinean "cazerolazos" in 2001 that brought down the de la Rúa government, for example), this scenario could have the perverse effect of not putting enough pressure on Mexico's political leaders to pursue radical change and at the same time keeping the economy locked in a state of uncertainty that benefits nobody. The first question to be asked is whether - considerations over instability aside - Peña Nieto should resign. Up to September, one could argue that the balance of his two first years in office had been somewhat positive, despite mediocre short-term economic management and an inability to bring down crime. His government's direct responsibility over the Ayotzinapa tragedy is also dubious; the disappearance of the 43 students occurred in opposition territory and any pointing of fingers towards the "State" implies that he and his party hold no bigger share of the blame for this crime than the rest of the political establishment. Ultimately, whether or not Peña Nieto has performed well is subjective, and perceived ineptitude is simply not enough for a head of state of any democracy to quit (there'd be a lot of snap elections everywhere if so). The accusation of conflict of interest stemming from the first lady's "white house" scandal is a much more serious matter since it tarnishes one of the most important requirements in a head of state: his incontestable adherence to the rule of law. With this in mind, it is truly hard to imagine how a scandal like this would not lead to impeachment proceedings in the US (let's recall that both Nixon and Clinton faced this over far more trivial crimes), or to a vote of no-confidence in a European parliamentary system. If the accusations prove to be well founded - tellingly, the PRI has blocked an attempt to create a special commission in Congress to investigate it - the idea that this scandal must not be reason alone to force Peña Nieto's resignation suggests that Mexico should be held to a lower standard than the West in allowing overt corruption within highest echelons of government. In other words, an already dreadfully corrupt system somehow deserves getting a free pass at being even more so. But even if there are solid grounds for his resignation, will he? If history is a guide, the bets should be on Peña Nieto remaining in his post until the end of his term and undertaking a half-hearted cabinet reshuffle at some point in the near future - at most. In a country where even the lowliest of politicians clings to his post in defiance of the gravest of crimes, expecting the president to quit barely a third of the way into his term is almost inconceivable. Update: After this piece was written, the chief of the presidency, Aurelio Nuño, stated that there was nothing left to explain about the "white house" scandal and that &nbsp the case is closed. Yet the day before, another scandal over the first lady's properties emerged, this time a $1.77m apartment in Miami that was paid off in 2011. A further march in Mexico City is expected today, exactly two years from the day of Peña Nieto's inauguration.